2018 Triumph Bonneville Speedmaster. Picture credits - Triumph. Submit more pictures. 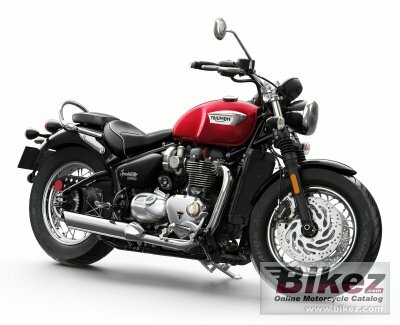 Features Triumph�s critically acclaimed 1200cc engine, with category leading higher-torque and signature Bobber tune and engine mapping that delivers peak torque of 106Nm at 4,000rpm � a massive 42% more than the 2015 Triumph Speedmaster and up to 10% more than the current Bonneville T120. Price as new (MSRP): US$ 13150. Prices depend on country, taxes, accessories, etc. Frame type: Tubular steel cradle. Twin-sided, tubular steel swing arm. Ask questions Join the 18 Triumph Bonneville Speedmaster discussion group or the general Triumph discussion group. Bikez has discussion forums for every bike. View comments, questions and answers at the 2018 Triumph Bonneville Speedmaster discussion group. You can sign up for e-mail notifications when other riders answer you. If you have extensive experience with the MC, please send us a review. If you consider buying this bike, you should view the list of related motorbikes Look at photos. Compare technical specs. And check out the rating of the bike's engine performance, reliability, repair costs, etc. You can compare the rating with other bikes.